So I’ve been spending a LOT of money in the last 3 years. They tell me it’s an investment, and I really, truly, am starting to believe them – but it still hurts to know I am in this much debt, and, that it’s all on me to get out of that debt with all my “skilllllls” I’ve been developing. That investment is my education. You know, the place they make you pay to then have them make you meet deadlines, write huge research papers, and read interesting books. And since I am paying for it, I for some reason would like to share a paper I recently wrote. Portrait of a Lady was an assignment from my Humanities French Culture class. We were to take a jaunt to a museum that contained artwork from France’s past and to then write a paper on why we chose that specific piece. The following text is my personal Museum Report. My experience. My personal thoughts. Comments welcome as always. Have you seen this portrait? What does it evoke for you? On Friday, November 14th, 2014 around 3 o’clock p.m. I journeyed to the beautiful, and nation’s largest urban cultural park in San Diego, called Balboa Park where there is a plethora of museums (15) displaying historical preservations of art throughout the world, along with the chronicling of technological advances, a botanical garden, a theatre, a Zoo and much more. The day’s quest entailed happening onto a piece of artwork from the Visual Fine Arts era that took place in France for my revered Humanities “French Culture” class. 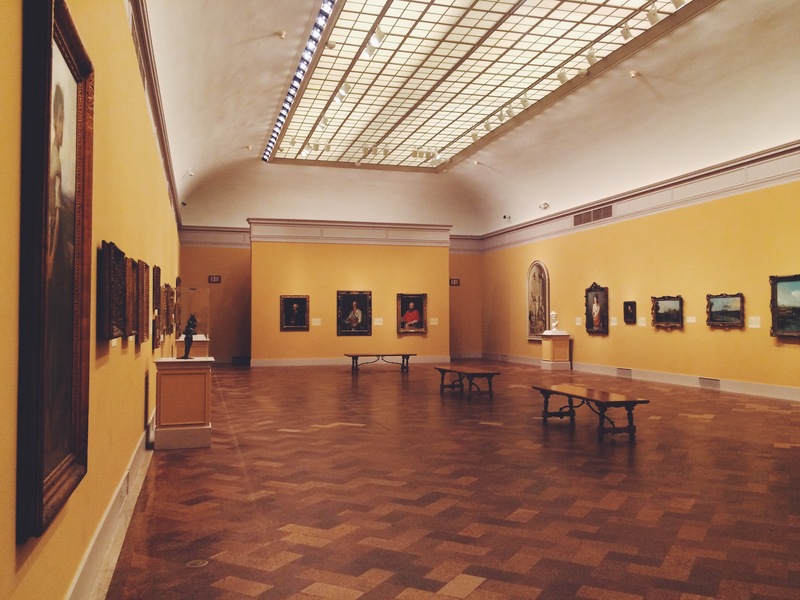 Upon entering The San Diego Museum of Art I was directed to the European Art gallery located on the second floor. I walked into the enchanting sunshine yellowed wall expanse where ornate Rococo style frames hung bountifully. About half way through the room I intersected a mutely vibrant painting of a semi-conservative lady of elegance. This particular artwork was coined “Portrait of a Lady,” recently attributed to the artist Marie-Guillelmine Benoist of 1799 done with oil pant on a canvas. Before I delve into why I chose this oeuvre over the others in the room, I would like to give a little history on the artist and the time period. Miss Marie was born in Paris, France in 1768 and died in 1826. Benoist was one of the best-known women painters of the French revolutionary and Napoleonic periods. 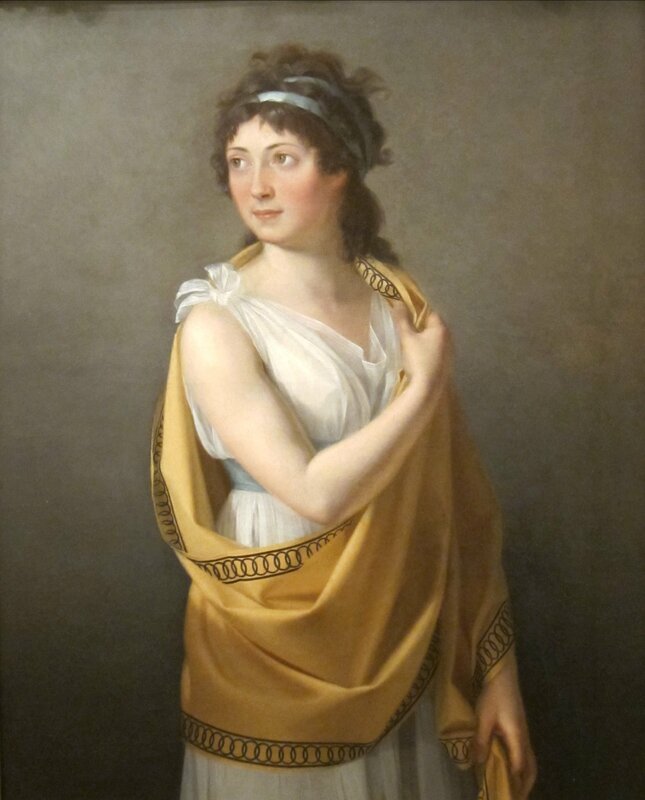 Having been taught by and working under iconic artists: Marie-Louise-Elisabeth Bigée-Lebrun and Jacques-Louis David, Benoist went on to regularly show at public exhibitions in Paris and Versailles and was endowed with several honors from the French Government. Because of Benoist’s time spent with Jacques-Louis David she developed a similar painting aesthetic, which is why this individual piece, amongst others, has only recently been attributed to her portfolio. The reason I felt drawn to this singular artwork came down to a quite feministic view. However mutely art historians would like to argue this painting displays, I feel it to be a vibrant vocalization of the beauty a woman beholds; one that comes with the double edged sword that on one side requires a lady to be physically enticing while on the other side hoping to evoke a mindful, intellectual interest. Lady stands in the room confidently, on her own, with one arm across her chest – her heart – not only symbolizing the protecting of emotions but visually dumbing down the revealing of her womanhood: her chest. It is evident that when Lady woke, she prepared herself for this depiction. She carefully placed the ribbon in her voluminous curls, pinched her rosy cheeks, and selected a divine but relaxed gown with a complimentary shawl. (A repeated Benoist styling.) The title of this piece I feel could be also deemed “Definition of a Lady.” Her translucent skin gives way to vulnerability…sensitivity to the physical as well as the emotionality only a woman can experience, a frailty. Her wide eyes display the zeal every lady should behold in my opinion: one that gives a listener confidence in their speaking, and a look that radiates a love, a desire to know more, become wise, and experience the world with all the senses it beholds. In a world where two hundred years ago women were submitting to their husbands political stance (Benoist reference to her reason for retirement at age of 46) and widely accepted view-of-role I feel that a painting of this extent is profound. In retrospect this painting can begin to depict the development of women’s desire for rights and their hope for recognition and respect for their utter character as a magnificent creature of God. If a timeline with photographs were rendered of those Ladies who sat-in for an artist to reveal a piece of their soul from the beginning of Art versus the male counterpart, we would see that what it takes to be a Lady – a woman – requires much more strength than any man could evoke in an oeuvre. Portrait of a Lady spoke to me in a spiritual manner that required an in-depth look at a female embodiment, by being acutely detailed in the way it was executed… something no other painting or sculpture in the museum’s room by a French artist was capable of, to me.